Even if it’s your first time, stepping into Paddington’s Verve Hair is like coming home, or meeting up with old friends. 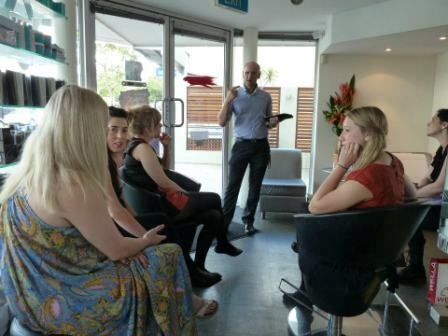 “Yes, that’s what customers tell us says Dabian Marning, co-owner with his wife, Leigh Welch, as he stands in one of Brisbane’s most vibrant and successful inner-west salons. “It’s all about using social media properly,” Dabian says. “Our customers become interested in what we’re doing with Wella products, and they get as excited as we do when a new Illumina Colour comes out. Through social media we keep them in the loop with everything—competitions, Illumina training from Wella’s Rob Bradder, upcoming events, testimonials, even fun staff vacations—everything that makes them feel part of the family.